Warwickshire PCC, Ron Ball (On The right in the Yellow Jacket ), pictured with the Rugby Street Pastors and clubbers. 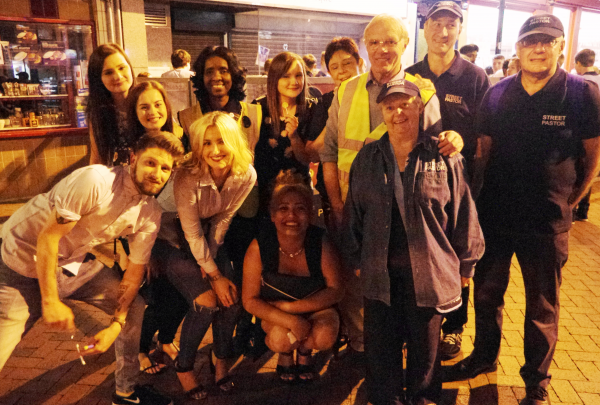 On Saturday July 4th, Warwickshire Police and Crime Commissioner (PCC), Ron Ball, went out on patrol with the Rugby Street Pastors. This was preceded by a tour of the Rugby First CCTV Control Room. While on patrol, Mr Ball experienced first-hand the Rugby night time economy, including visiting night clubs and talking to the door staff and clubbers as he patrolled Rugby’s streets. Before going out on patrol, Mr Ball formally presented a cheque for £5,490 to Rugby Street Pastors. 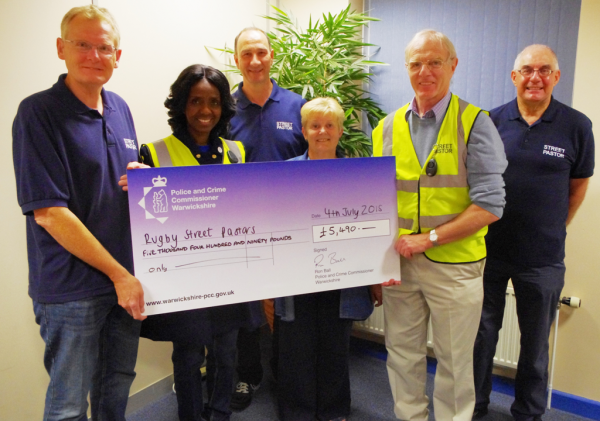 The £5,490 was the second year’s funding awarded to Rugby Street Pastors and is part of a £1 million Commissioner Grant Scheme, set up by Ron, which invites bids to fund local projects that support the victims of crime, and help reduce crime and anti-social behaviour. Warwickshire PCC, Ron Ball (On The right in the Yellow Jacket ), presenting the cheque to the Rugby Street Pastors.